Let’s be honest, I’m LAZY when it comes to breakfast. Nevertheless, since it’s the “most important meal of the day”, I’ll eat breakfast, but what I consume is pretty routine and boring: on weekdays a staple of peanut butter toast or cereal (with berries thrown in on occasion). On weekends my effort goes up a bit – scrambled eggs or pancakes sometimes make their rounds. Don’t get me wrong, I love breakfast dishes! But, it takes a while to get my creative juices flowing, so throwing together an extravagant meal first thing in the morning is difficult. Having used One Kitchen for dinner, I was excited to hear they now offer breakfast options providing you a hearty start to the morning without all the prep work. With a couple dishes offered weekly, I tried their sweet and savoury selection. Admittedly, I’ve only made pancakes with powdered mix from a box. So, when One Kitchen’s recipe called for vinegar, I was thoroughly confused. Even so, I followed directions and the cappuccino pancakes turned out fluffy and cakelike. 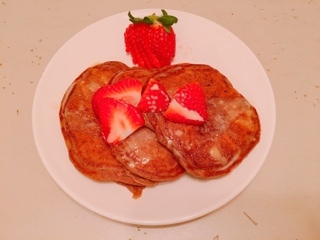 Much more aromatic than my typical pancakes (thanks to the espresso powder and egg added to the batter), so they didn’t rely solely on the sauce for flavour. 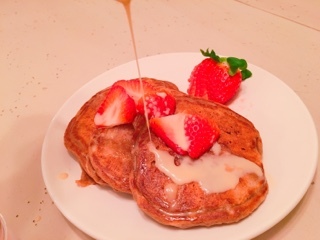 In this case, rather than maple syrup, a dulce de leche glaze was included, and was thinned out with milk so it didn’t become overly sweet (great if you’re not into overly sugary foods first thing in the morning). Meanwhile the huevos rancheros were so filling that we took the meal for two and turned it into four. Having had the dish on a number of occasions, I expected it to be harder to prepare. 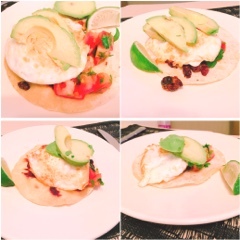 However, the bean mixture was quick to whip up, the three ingredient salsa not much harder, so what ended up taking the most effort was frying the eggs without breaking them. I would have liked the beans a little saucier (so would suggest thinning it out with some water or stock), but it was still a great rendition of the Mexican staple. Soon they will have smoothie options for those who prefer to drink their meals. I’m normally not a liquid diet fan … there’s something about biting and chewing something that’s oh so satisfying. 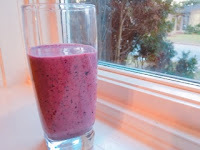 But, having tried the berry smoothie it’s surprisingly satisfying. The morning I had the concoction, it wasn’t until around 11:45 my stomach started warning me to get ready for lunch. 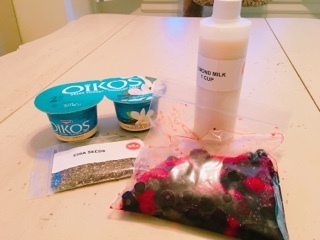 Maybe it’s the thicker Greek yoghurt or chia seeds that gets added, but the smoothie ends up being fairly thick and has a chewable quality to it. If you’ve never heard of One Kitchen, they’re a Canadian meal-kit delivery company that sends weekly customizable boxes containing all the ingredients (and recipes) you’ll need to prepare meals. You can choose between two or four people plans with three to five recipes – the more you purchase the cheaper it gets: for two people it ranges from $10.49 - $11.49 per serving, while for four people it drops to $9.49 - $10.49. Although they can deliver every week, if you ever need to stop, just put your account on hold and nothing will get sent until you start up the account again. For a fuller account of their service, check out my dinner post. Now that One Kitchen has expanded their offerings to breakfast, it’s even more convenient for customers to feed their families (and even caters to those who like having breakfast at dinner). Intrigued? You can try it out for yourself by visiting their website, selecting any of the meal plans (including the largest) and using Gastroworld as the coupon code. You'll see the 40% applied off the subtotal. Get cracking!